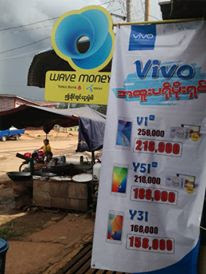 I have written widely on this blog previously on WING but having just come back from a week in Cambodia on holiday I felt compelled to write a short blog on how the business model is developing. In short the growth and success of the business has been outstanding. There was an emerging global trend that was seeing convergence of mobile operators and banking services in the mass market. When I think back to 2008 when we created WING to address these opportunities, it is fascinating to see how WING is performing in 2014. After a year away from Cambodia, the over-riding impression I had on the drive to the center of Phnom Penh was the sheer number of WING Cash X-Press outlets (agents). I was also very interested to see how they had morphed in many cases from mobile phone shops or general grocery stores to become primarily agents. This was clear from the infrastructure paid for and built by agents, including small branch and teller areas. This is a compelling difference from the early days of WING, and I imagine most mobile money providers - agents are now competing to provide the WING business, and will invest in their own shops to attract customers. Whilst I didn't visit the provinces on this occasion, I have been told that the agent infrastructure is of similar quality. The second observation I had during my brief time in Cambodia was the number of people who used and knew of WING. Every single remork (tuk tuk) driver I spoke to, every wait staff in shops and restaurants knew of and in many cases used WING. In addition, WING is now providing payroll and commercial services to many corporates in Cambodia leveraging their liquidity solutions. With anecdotal payment volume of US$350 million in June, and a projection for this year of well over US$3 billion, WING has become the national payment system for micro payments and money transfer in Cambodia. So, approximately five years after the launch of WING, it is fantastic to see that the opportunities we first identified in 2008 and 2009 have been realised. It is also interesting to speculate whether previous owner's ANZ now have some regret in divesting when they did in 2011, given the success of the business since that time, and the opportunity to offset some of the negative public relations they have experienced in that market recently with a positive story of how WING is helping low income Cambodians to save and send money cheaply. The next layer that will take it to the new heights is remittances from Thailand, Korea and Malaysia.Formal remittances from these countries were around US$ 300 M last Year. Wing is a Great Success Story. Thanks Ludwig, much appreciated! By the way, in New York over Christmas this year so hope to get the chance to catch up again.